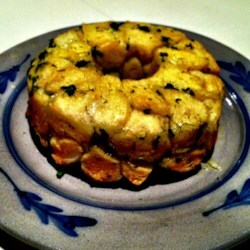 "A full recipe of monkey bread is in a Bundt® cake pan or mold pan. Cut recipe in half to bake in a smaller metal mold or iron skillet. May be made the night before serving." Stir melted butter, parsley, onion, and dill together in a bowl. Dunk biscuit halves into the butter mixture to coat; arrange into a tube-cake pan. Bake in preheated oven until dough is cooked through and golden brown on top, about 30 minutes.